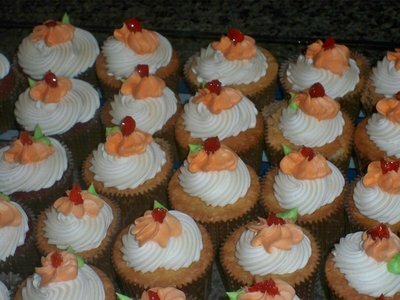 Cupcakes have grown in popularity with cupcake connoisseurs setting up what they term "Cupcakeries". Has your fondness for the cupcake grown as well or is this just a passing fad? I like them both on different occasions. Cupcakes for snacking but for dessert I have to go with cake. Personally, I prefer cakes. Cupcakes and cool and tasty and all that jazz but a nice moist slice of cake...well, it takes the cake. I like pastries of sll types . Its doesnt really matter, if its good I'll eat it. I love making cup cakes and taking them to my grandchildren. I usually split the mixture into three and I make some vanilla, some chocolate and some strawberry. I ice them (icing not frosting) and sometimes I put hundreds and thousands on the icing. A while back I bought some tiny candy dinosaur shapes which the kids loved. Cupcakes! I love to do weird little decorations that kids enjoy! I never to make both, but I want to try to make cupcakes. They're not a 'fad'; have been around for decades', but it seems people are noticing them now for 'remembrance'! But the multiple 'flavours' available now is astounding! And they still taste good, with a 'cuppa'! Next best, is a fresh 'Lamington'! Should government have a say in what you name your child?